Dubbed BroadPwn, the critical remote code execution vulnerability resides in Broadcom’s BCM43xx family of WiFi chipsets, which can be triggered remotely without user interaction, allows a remote attacker to execute malicious code on targeted Android devices with kernel privileges. “The most severe vulnerability in this [runtime] section could enable a remote attacker using a specially crafted file to execute arbitrary code within the context of an unprivileged process,” Google describes in the July 2017 Android Security Bulletin. The BroadPwn vulnerability (CVE-2017-3544) has been discovered by Exodus Intelligence researcher Nitay Artenstein, who says the flawed Wi-Fi chipset also impacts Apple iOS devices. Since Artenstein will be presenting his finding at Black Hat 2017 event, details about the BroadPwn bug is scarce at this moment. “The Broadcom BCM43xx family of Wi-Fi chips is found in an extraordinarily wide range of mobile devices – from various iPhone models to HTC, LG, Nexus and practically the full range of Samsung flagship devices,” the abstract for Artenstein’s talk says. 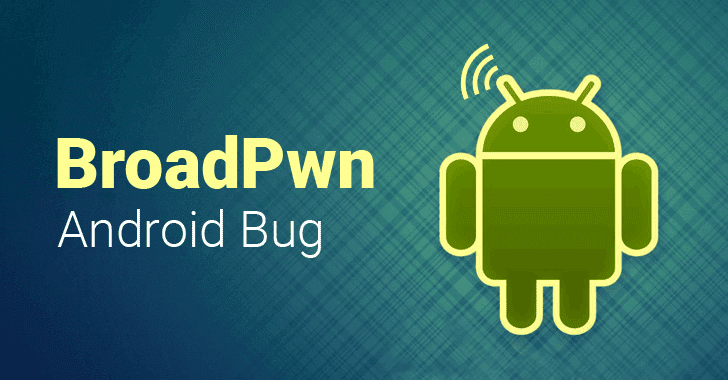 Besides the fix for the BroadPwn vulnerability, July’s Android Security Bulletin includes patches for 10 critical, which are all remote code execution bugs, 94 high and 32 moderate rated vulnerabilities. Two months ago, an over-the-air hijacking vulnerability was discovered in Broadcom WiFi SoC (Software-on-Chip) chips, allowing attackers within the same WiFi network to remotely hack, iPhones, iPads, iPods and Android handsets without any user interaction. Among the other critical flaws is a long list of vulnerabilities in the Mediaserver process in the Android operating system, which also allows attackers to perform remote code execution on the affected devices. One of the vulnerabilities is an issue with the way the framework handles some specific files. The libhevc library has an input validation vulnerability (CVE-2017-0540), which can be exploited using a crafted file. “A remote code execution vulnerability in libhevc in Mediaserver could enable an attacker using a specially crafted file to cause memory corruption during media file and data processing,” the vulnerability description says.